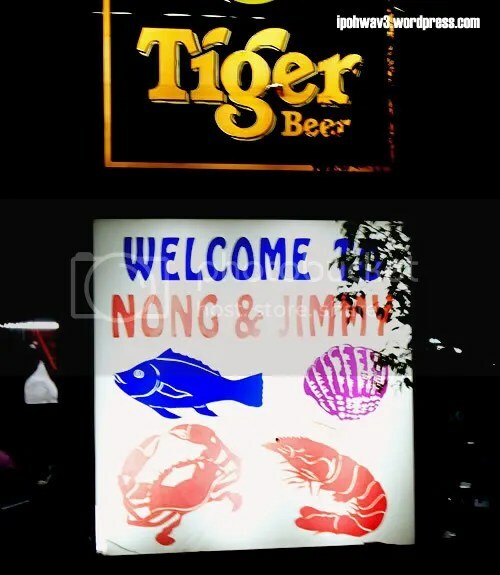 Nong & Jimmy Thai Seafood BBQ @ Taman Cahaya, Ampang, KL | Ipoh Mali Talak Sombong! Fortunately, on the third day, I got a surprise call from WMW, saying that she’ll be coming to Cheras with Jackson to have dinner with me (Yay! *jumping up and down*) and asked me to figure out where to dine. Immediately, I thought of a Thai seafood place in Ampang and without hesitation, I suggest that place. We finally reached at Nong & Jimmy at Taman Cahaya, after made several calls to my friend, asking for directions. WMW claimed that she came here before but that was few years back. Jackson on the other hand, never been here or heard about it before. WMW: 2 plates enough ah? Make it 3! Jackson: Whoa..! I think that’s too much laa. WMW: Yalah, it’s very good, you know. Ahem… guess that he’s freaked out by our greediness. Anyway, we only ordered 2 plates as the dishes started to come not long after that. Thai Mango Salad. 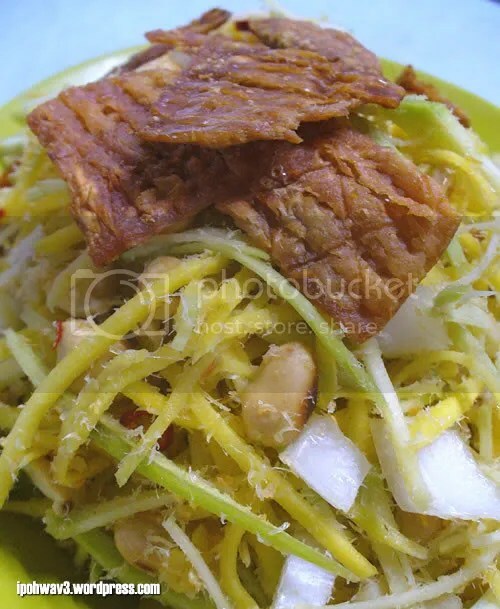 Shredded half-ripen mangoes tossed with chopped onions, peanuts, chopped chillies and dried cuttlefish. We hearts this a lot for it’s not too sour, just nice. Me being a non seafood fan, felt in love with their sotong bakar (grilled squid). The slightly charred squid gave a pleasant barbequed, smoky flavour. 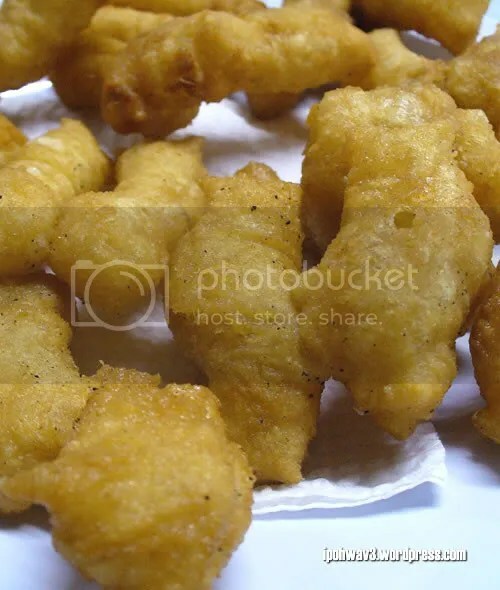 I had this just on it’s own, without dipping them into any chilli sauce. Of course we can’t miss the Tom Yam Seafood soup. Loaded with goodies such as prawns, squid rings, button mushrooms etc. 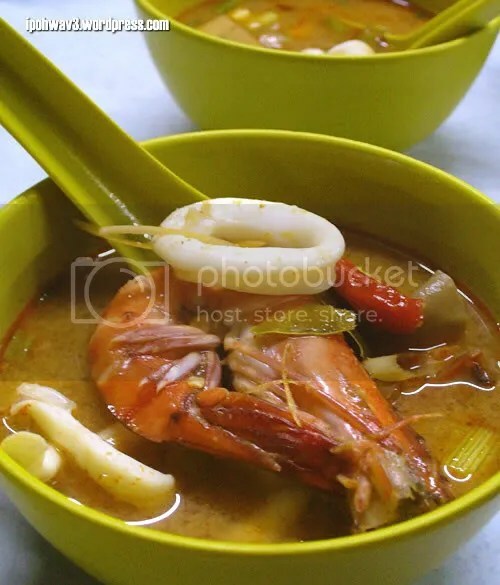 The soup itself is very flavourful, with just the right amount of spiciness and sourness. Milder version is available upon request. Thanks to dear WMW and Jackson again for the wonderful company. This entry was posted in Food (KL), Gathering, Type: Thai by Jason. Bookmark the permalink. lol! funny conversation u guys! love the sotong too! i have always wanted to try this place but am clueless how to go 😦 got map? Hahaha…you always think of me whenever you see crabs hor? I would love to join you guys that day but WMW called me when i just finished my dinner…somemore told me you guys going for Thai food and i just touchdown from my trip to Phuket. Never mind, next time yah. MeiYen: I’ll try to get one and put it here. Else, we can organise a trip here. Precious Pea: Yalah. Yeah, WMW told me that too. You had plentiful of seafood at Phuket already! Yep, next time. wow, has been years since i went to nong and jimmy! i remember it serves great grilled prawns too..
Woow, the fried crulles looks nice to go with the kaya. Should drop by there one day. hehehe….As always, good food, good company! Wah! tak ajak pun…. sombongnya….. lol! goooodness, they are tempting! especially the thai food! 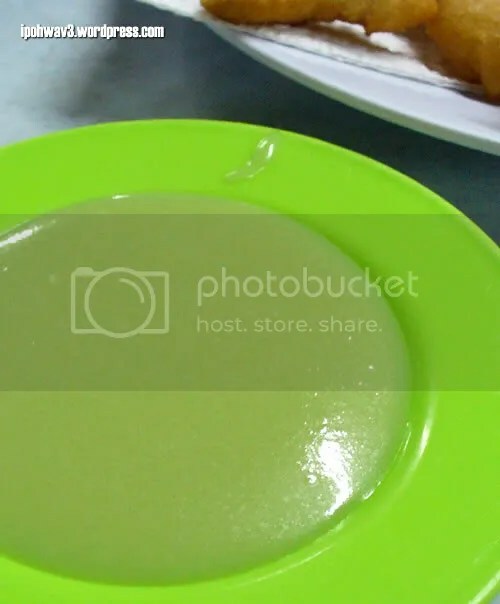 God of Food: The fried crullers with kaya – highly recommended. WMW: Shall we make that our slogan? Hehe. Jackson: Let’s go again one of these days. BBO: Was in a rush that day. Next time! Teckiee: Em… where did you see green chilli? Yeah, the sotong bakar is good! Ai Wei: Hi there, welcome to Ipoh Mali. Nice blog you have there! Ohh nice different styles of seafood. Nyamm! 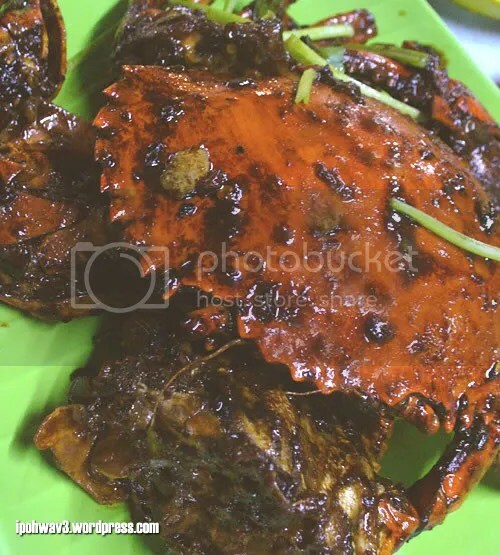 Black pepper crabs… sai ti mo ah?? 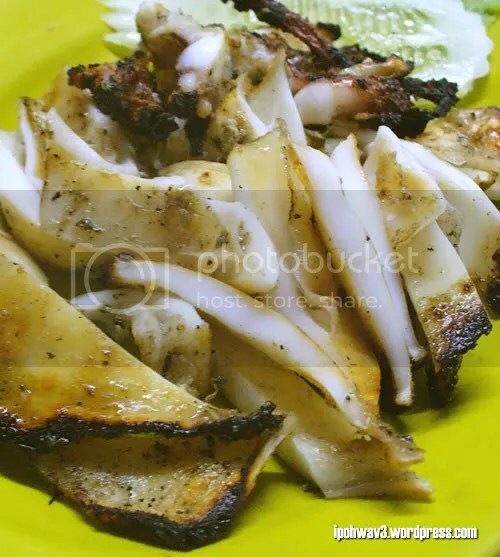 I like the bakar sotong… looks good!! this is one of my fave place!!! glad you’ve tried them. eh din order cockles? it’s one of their famous item and usually first to finish. Durianberry: We wouldn’t notice if you didn’t mention it! Celine: It’s still tastes good. Tonixe: Enlarged the font size in the next post. Thanks for the comment! Ethan: Hi, thanks a lot for visiting! NKOTB: Em… black pepper crab wor, why wasted? wah… i went there last sunday… the crab bakar kill me lo… 2 crab RM56 walan….. so expensive..
Edwin: They charge the crab based on the weight. Are the crabs big in sizes? oh ya, this seafood restaurant, vryyyyyyyy nice oh!!! J2Kfm: I think it’s open for dinner only. Let’s go there next time! see the pic look like very good but don’t know the price good or not? Samantha: Other than the crabs, other items are pretty reasonable. Pingback: The Hidden Thai Gem, Sawatdee « Ipoh Mali Talak Sombong! is it the food at nong & jimmy halal? Hi Fiona, I dont think they’re halal.